For more reviews please visit our YELP page!! Mike Jones and the Primal Canine team have been great. My wife and I got a Cane Corso (Italian Mastiff) when he was 4 Months old..a little older then normal when getting a puppy, so we were concerned with the potential habits that he might have already developed... We have two young boys and two cats...so with having a 100lb+ dog around the house we wanted it to be good for the whole family and enjoyable. We started with Primal Canine from day one. Mike went through his Methodology, of good behavior reward, bad behavior correct, and you are the leader of the pack. I could tell that he was passionate about what he does, and it shows through the whole staff as well. Brandon is the trainer that works with us directly, we do a Private session with him, two group classes, and one protection class. My wife and I work full days, we did not want to keep Tiny at home during the day, for overall well being of a dog who would not have interaction with people during the day. We enrolled him into Fit Pet. This is basically a doggie day care that Primal Canine offers. He gets exercise, socialization, and agility training during the day. The day team is great, Q, Taylor, Thomas, and Kevin all take a special interest in the dogs that are there. The whole Primal Canine team is genuinely concerned about the development of Tiny's behavior and progress, as well the interactions that Tiny has once he leaves and is at home with us. Tiny's behavior has been great thanks to Primal Canine's team. He is now 1 year old, and we just bought our second dog, same breed...another big one. Nyx is now also part of the Primal Canine Pack and Fit Pet. No we have 1Yr old 120lb dog around the house, and 12 week old 23lb dog around the house and would have never done it if Tiny was not as well behaved as he is...and we know Nyx is going follow suit. We have been very happy with Mike and team, we have referred a couple people to him and team, as well people that I have told at our office, have referred the Primal Canine team. Thank you Mike Jones and Primal Canine. This place is what everyone is searching for when it comes to dog training. Mike and his incredible staff have trained two of my dogs. I can't say enough on how pleased I am with the job done. Primal Canine knows how to make pet ownership a real pleasure! I really love this place. We started taking our maltipoodle here a few months ago, and our dog is completely changed. When we started he didn't like listening to us, and had really bad leash aggression. Mike and the crew gave us a few private lessons, and we have been attending a weekly group class. Because of the training from primal canine, I now feel comfortable taking my dog anywhere!!! I'd recommend primal to anyone with a dog. Big or small, fluffy or non fluffy! 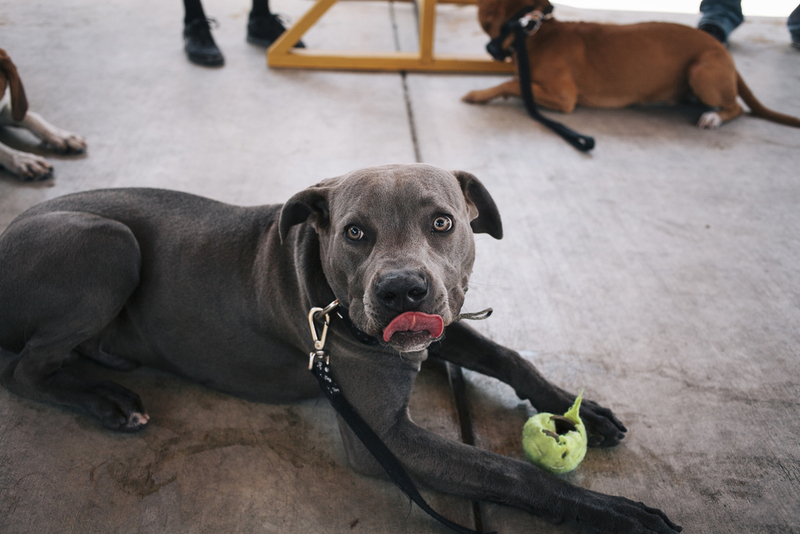 Take your pups here and see how training can improve your life together! Taylor and Mike are awesome (so are all the trainers but I primarily worked with these two). When I initially visited Primal Canine in December 2013 I had already trained with one other trainer and talked to several others. I immediately felt comfortable with Mike and his team. All are awesome people and trainers. When I started I was at a loss at what to do with my leash aggressive dog. He was attached by an off leash dog and he went from a calm happy dog to a fearful and aggressive dog. I had done everything I could think of and spent so much time trying to resolve this problem with little success. After a few months of training and practicing the techniques learned at Primal Canine my dog now can walk with, by, next to and across from other dogs with little to no issue. I honestly didn't think this would be possible again. Mike and Taylor (and team) have helped me to get my dog back under control and close to the way he was before all this started and I look forward to continuing this progress and seeing what else he is capable of. Primal Canine is THE BEST!! IF I COULD GIVE THEM 1,000 STARS I WOULD!!!!!! I came to them in April with my 11 month old Brazilian Mastiff (Fila Brasiliero). Everyone thinks "awww mastiffs they're so sweet and gentle giants"... NOT Brazilian Mastiffs, they are bred to not like people, AT ALL. When I first got Max, he was perfect and not your regular Fila, loved dogs and loved people. I got him neutered at 8 months old and from 8 months old to 11 months old (3 month span) he tried to bite about 9 people and actually bit 3 (quaratined once). I was getting to the point where I was having no hope and anxiety that I would have to put my dog down if he keeps acting like this, and not by choice but by the city doing it for him biting so many people. I had multiple trainers tell me there is no hope for my dog, and that "its his breed he should not be around people" and that I should put him down. My last hope was Primal Canine. The very first class, of course, Max bit one of the trainers. Not once, but twice. I was in tears and for sure thought they were going to turn me away. Mike and Quinn both reassured me that they will be able to work with Max and I. After the first two classes, guess what, I WAS ABLE TO HAVE PEOPLE COME UP TO MY CAR TO ACTUALLY MEET MAX AND HE LET THEM PET HIM!! I was in shock and in tears of joy. I signed up for the FitPet packages and after his first FitPet class he was SO GOOD!! They told me that even the trainer Max bit was able to take him for a walk and he was fine with him! After the second class they got him on the treadmill, SHOCKING!!! I ended up getting Maxs brother, Hunter(his liter mate-another Fila), on a bad situation: his owner couldnt take care of him or handle him anymore. Hunter is scared of everything and everyone and is a fear biter (max is an aggression biter). So far we have been working with Hunter too along with Max and Hunter is a TOTALLY DIFFERENT DOG!!! He used to be scared of big structures and not wanting to do anything and guess what, HUNTER IS DOING AGILITY AND HE LOVES IT!!!! Hunter is still a little skittish, but that takes time of course, but he has changed beyond belief. If I run into any problems that I dont think that can wait until the following week training class, I can call them up and they are more then willing and happy to help me over the phone!! I have done that a few times too- I'm a worry freak and they ALWAYS ALWAYS ALWAYS reassure me that everything will be ok and work out. I really thought all hope was lost with Max, and now I have a dog who can meet majority of people. Hunter is a work in progress but just going to primal canine for that short period of time so far (and still pleanty more to come) he has shown so much improvement. If it wasn't for Mike, Quinn, Taylor, Kevin, Sara, and Thomas I don't know what I would do right now!! THANK YOU SO MUCH PRIMAL CANINE!!! I HAVE THE PERFECT TRAINERS FOR MY (in my opinion) SOON TO BE PERFECT DOGS AND ITS ALL BECAUSE OF YOU AND YOUR AMAZING PACK FAMILY! From the moment we first arrived and I witnessed the obedience of the variety of dogs in the training area I knew we had made a great choice. Mike was very patient, explained what he was doing in easy to understand terms and in very little time I could see that the problem was more with 'the owners' (ok, maybe just me) than with the dog. We have attended many individual and group sessions all of which have been extremely helpful. All of the training staff are professional, friendly and accommodating. I would recommend Primal Canine to any dog owner without hesitation. I highly recommend Primal Canine! Mike truly is an expert when it comes to training dogs and their owners. He has a connection with dogs and that's what makes him so great! Call Primal Canine today, you won't be disappointed! Signed up my 11 month old 110lbs cane corso 2 months ago after a great evaluation with Mike. She was a hand full up to that point. Completely different dog after 1 private lesson. Primal K9 is extremely professional and very caring for my dog. They tailored a training program specifically for my dog and adjusted as needed based on her progression. She is completely obidient off-leash. She has been doing so well I will be starting her personal protection program shortly. Highly recommend Primal K9 to anyone who needs assistance with their dog. I've also left my dog with them on several occasions for their fit pet program. Absolutely amazing staff! My rescue lab, Moose, has been coming to Primal since he was 4 months old. He received his Canine Good Citizen training and certification through Primal. Moose enjoys the variety of classes that are offered and especially likes the Out and About class done off leash at the Rose garden. Mike Jones, Brandon, Taylor, and the rest of the staff really take the time to know each dog individually and train them to their unique needs. Everyone who has a dog should bring them to Primal Canine. We welcomed an adorable 7 week old blue nose pit bull into our family on New Year's Day. We already have a 9 year old mini pinscher who wasn't properly trained nor socialized, so we wanted to do things right with our new pup especially since he won't be a little 8 pound pup for very much longer. After a recommendation from a good friend who also takes her dog to Primal Canine, we went in for a free consultation and met Mike Jones, owner and head trainer, and his dog Bear. Bear was so well behaved even with a tiny, rambunctious puppy jumping all over him and Mike seemed like a great trainer so we knew right away that we found our training facility. I contacted Sara a few days later to set everything up and she got us into training right away. She is a phone call or text away so if I ever have to reschedule (which I do often due to a busy schedule) she is a quick text away. She is awesome! Smokey joined the pack and started training with Brandon at around 12 weeks. Brandon is AMAZING. He was able to connect with Smokey and train him according to his personality. Puppies have a short attention span so he always took that into account and changed things up so Smokey wouldn't get bored of the same old routine. He is very knowledgable and provides great feedback and answers all my questions (which I have a lot of!) In the short time we have been going to Primal Canine we have seen great improvements in Smokey and are confident he will only get better. If you have more than one dog at home they also encourage you to bring them so they will get trained together especially when the other dog isn't trained, which is our case. We haven't been bringing our min pin due to an injury so we train her at home using the same techniques and we have seen an improvement with her as well. What's even greater is that Brandon is available by phone so if I ever have any questions I can send him a text and he answers right away. Taylor is just as amazing. Prior to doing agility with her, Smokey was very iffy on all the courses except for the A-frame. After doing agility with her, he built up his confidence and started enjoying the other courses more. She too is very knowledgable and showed me proper methods on the agility courses. Everyone at Primal Canine is awesome! I really wish there was option for more stars because this is one of the very few places that actually deserve it. For the record, I'm giving Primal Canine 100 stars! I recommend them to everyone I know who has a new dog and random people I meet at dog parks and puppy socials. I have been bringing my dog Ozzy to Primal Canine for about a month now. Brandon has been our main trainer. Ozzy's focus and general obedience has been changed by leaps and bounds since starting here. I will definitely continue to come here and refer everyone I know with dogs to this facility. I can't wait to see ozzy's progression in the coming months while we train for his CGC. A+++ for Primal Canine. Mike and his team are great, and the results really speak for themselves. My husband and I got our boxer pup when he was just 8 weeks old, and wanted to start him off training early so that he would be well behaved enough to bring to work with us. We also keep him indoors, so we wanted to make sure that he didn't destroy the house. We took him to a puppy class where it was very much treat based, and while he did learn the basics (sit, down, stay), he ended up only doing the commands when he felt like it, and not when we told him to. This led to him thinking he was the head of the household, and he would end up jumping on the furniture, on us, on strangers, and running away from us when he didn't want to obey. At work he would bark and whine at other dogs and people, and mouth them if they tried to pet him. This changed when we enrolled him in Primal Canine. Through individual sessions and close attention to our pup's personality and the way he learns, Mike helped us with training methods and practice that really made a huge difference. Our boxer is now a year old, weighing in at a small 44lbs and he can heel to us without a leash, and follows us wherever we go. He is well behaved in public, doesn't lunge or jump on strangers, doesn't bark at other dogs/people and we can see that his confidence level has gone up. Most importantly, he listens and focuses on us without having to call him more than once and without treats all the time. If you wanted to get your pup started early on training, I couldn't recommend Mike and Primal Canine more. They've expanded their program to offering group classes, a board-and-train program and doggie day care with agility and fitness included. If you are still shopping around for dog trainers, give them a call or email and get in for an evaluation. They even off a canine good citizen certification, which I want to have our boxer test for soon. My husband, Cung Le, and I were referred to Mike Jones, owner and head trainer of Primal Canine, by a business associate and friend, Damon Gee of KNOXX Gear. We had adopted a rescue terrier mix four years ago, and had never had her trained or properly socialized with other dogs. We had also just welcomed a Boze Kennel's, extra large pure bred Pit Bull, into our family of three boys. My husband and I both realized we needed to train our rescue "Princess" so that she did not influence our new puppy as he grew in size! We received many offers from dog trainers to train our dogs, but felt they were more interested in name recognition than our dogs obedience and socialization training. Mike Jones was a breath of fresh air. He was willing to work around our schedule, came to our home for an initial consultation and immediately instilled confidence, knowledge, respect and a profound desire to properly and completely help us train our dogs. My husband is an accomplished and decorated mixed martial artist and we value Primal Canine's unique approach to dog training which revolves around teaching humans how to command their dog's respect and properly reward good behavior and correct unwanted behavior. Instead of focusing on how a specific breed should act, they focus on what each of our dog's needs are individually. Primal Canine has worked with our terrier's anxiety issues as well as our Pit Bull puppy's lack of training. In the mixed martial world an athlete needs to be well rounded and able to adapt to any situation. Primal Canine's trainers are able to do just that with any dog they take on! We initially only wanted to train with Mike Jones, but quickly realized that all of his trainers possessed the same passion, knowledge and teaching skills that he had. Mike is constantly bettering himself and his "pack" of trainers even though they are by far the best training facility in the area. Primal Canine is a family of dog trainers who follow the same philosophy through practical and easy to learn steps. They are always willing to help and actually invite additional family members and friends to participate in the training so that everyone is involved and the dogs behavior can be modified by anyone who has learned the Primal Canine way. We have only been training with the Primal Canine pack for a few months and our three and a half year old son is already able to walk both dogs. We are overjoyed and cannot recommend highly enough the Primal Canine Training Center. Our only regret is that we did not find them sooner! It's taken me awhile to figure out what to say in my review as how do you elaborate on the word "perfection"? I wish you could see the dog I adopted after Mike rescued and trained all 120 full pit bull pounds of him. "Fred" never knew what walking on a leash was, or any form of exercise for that matter. Fred never knew socialization. Fred never knew anything other than how to try and survive being tied to a tree. The transformation of this dog is nothing less than remarkable. I have had this gigantic love bucket less than six months and he is a walking tank of a miracle thanks to Primal Canine. Mike was there 100% of the time to answer any question big or small. We have ongoing training set up with group classes for continued socialization and privates to fine tune any specific challenges. Mike is always changing the training and agility course obstacles to keep the dogs on their toes and continue their learning and obedience. I truly believe learning to be the pack leader and giving your dog a purpose and direction makes you and your dog's bond tighter and your relationship that much stronger. 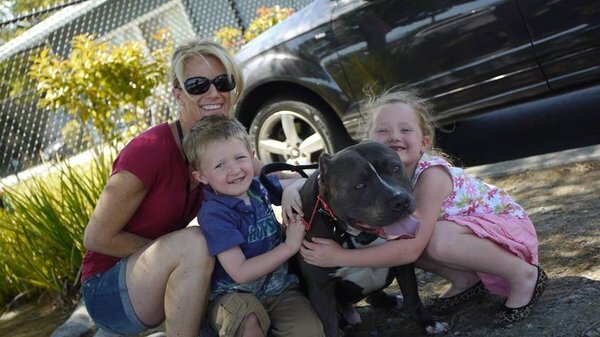 Fred is now happily living among an 11-year-old female pit mix, a fourteen-year-old male cat and two young children who never leave him alone. Owning a dog is a big responsibility and not one to be taken lightly. Do yourself and your dog(s) a favor and learn how to live together in harmony. Call the best. You will not be disappointed. “I love Primal Canine. This has made the challenge of being a first-time doggy Mom, so much easier. I love that Mike, the trainer, is always available to answer questions. He is knowledgeable and helps me feel prepared to navigate my training needs now and in the future. The one-on-one and the group classes have made such a positive difference in my puppy Emily that she no longer drags me down the street, pulls me down to the ground, no more jumping up on people to greet them and most importantly, no more bolting out the door and running away!!! Now that I have control over my dog even at her highest level of excitement, I know I can comfortably and safely take her with me anywhere. Although Emily’s favorite part of class is doing agility, I love the incorporation of obedience into everything we do. This training has given us both the freedom to enjoy each other and the world around us much more. d she has transformed into a beautiful, bright, boisterous diva! Her confidence now is through the roof and her obedience is better than ever! This team really knows dogs and their psychology and are always available to answer your questions." being around other dogs and people. He is now working around people and dogs. Its been a great transformation in him. I recommend primal canine to everyone that needs help with their 4-legged babies! Mike always answers my questions with everything and anything when it comes to my dogs training and diet! thanks primal canine! " Great training and great people! Mike is always available to answer questions and is very knowledgable of the canine mind. I have had a wonderful experience and Primal Canine has a training technique that truly works. Top notch training!